It’s not over til it’s over. – What's Up With Francis-Church? It’s not over til it’s over. A friend… “having married instead of going forward into the priesthood, took a degree at the late, lamented Pope John Paul II Institute, and began work in the great effort to restore the Church’s public voice on “life and family” matters. He has done this work for many years now, he has married and bought a house and now has four small children. He wrote to me a short time ago in a kind of agony of indecision. Faced with the Filial Correction, he felt obliged in conscience to sign; as a representative of a bishops’ conference, he believed it would jeopardize his employment, his home, the spiritual and material wellbeing of his wife and children, their hopes for a secure future. Well, not if you talk to this guy. Your Eminence, you have recently referred to our times as “realistically apocalyptic”. And you added that the “confusion, division and error” within the Catholic Church coming from “shepherds” even at the highest levels indicate that we “may be” in the End Times. Would you help us to understand what you meant by this? 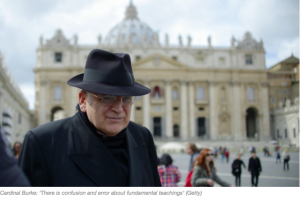 CARDINAL RAYMOND BURKE In the present moment there is confusion and error about the most fundamental teachings of the Church, for example with regard to marriage and the family. For instance, the idea that people who are living in an irregular union could receive the sacraments is a violation of the truth with regard both to the indissolubility of marriage and to the sanctity of the Eucharist. St Paul tells us in his First Letter to the Corinthians that before we approach to receive the Body of Christ, we have to examine ourselves, or we eat our condemnation by receiving the Eucharist in an unworthy way. Now the confusion in the Church is going even further than that, because there is today confusion as to whether there are acts which are intrinsically evil and this, of course, is the foundation of the moral law. When this foundation begins to be questioned within the Church, then the whole order of human life and the order of the Church itself are endangered. So there is a feeling that in today’s world that is based on secularism with a completely anthropocentric approach, by which we think we can create our own meaning of life and meaning of the family and so on, the Church itself seems to be confused. In that sense one may have the feeling that the Church gives the appearance of being unwilling to obey the mandates of Our Lord. Then perhaps we have arrived at the End Times. In the end, my friend signed the Filial Correction; we still don’t know what the fall out will be for him. Pray hard. Pray for my friend and his family. Pray for the repose of the souls of Cardinal Caffarra and Meisner. Pray for Cardinal Brandmuller who almost could but just couldn’t. Pray for Cardinal Burke. Burke’s road is a very lonely one, and I think us traddies are too hard on him. What good is a correction when only one cardinal has the guts to back it? It’s a useless gesture. Burke has done and is continuing to do his duty but the cancer is too far spread now. Anyone hoping that Pope Francis’s death will lead to some glorious eucatastrophe is kidding themselves. I will pray for your friend as requested. “THESE are the times that try men’s souls. The summer soldier and the sunshine patriot will, in this crisis, shrink from the service of their country; but he that stands by it now, deserves the love and thanks of man and woman. Will do. I pray for Burke every day. He needs to immediately either: 1) declare his opinion Benedict is still pope; or, 2) declare Bergoglio has been deposed ( or at least give a firm, short deadline until he may be considered deposed). Prayers for you, too, Hilary.